The Department of Energy and the National Institute of Standards and Technology have recently turned their attention to the long-term future of their research reactor user facilities. Meanwhile, unplanned shutdowns at both facilities have put a temporary strain on the U.S.’ already heavily subscribed capacity for neutron-beam research. 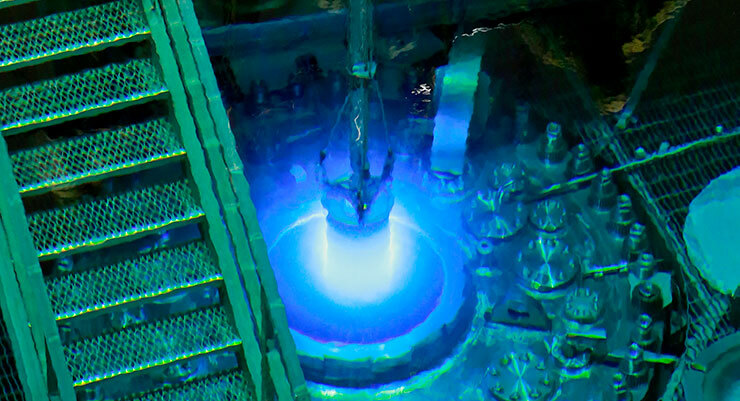 Oak Ridge National Laboratory’s High Flux Isotope Reactor during a routine refueling operation in 2015. Momentum is building behind efforts to plan for the future of research reactors in the United States. Currently, there are two major reactor-based user facilities in the U.S. that provide researchers with access to high-flux neutron beams: the Department of Energy’s High Flux Isotope Reactor (HFIR) and the National Institute of Standards and Technology Center for Neutron Research (NCNR). 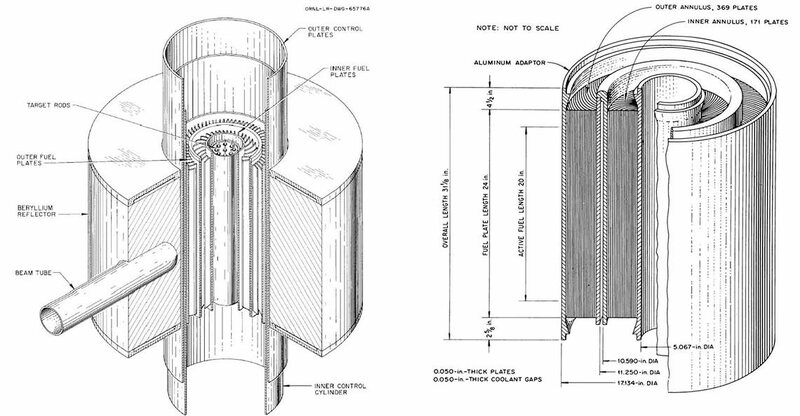 Both reactors are about five decades old. Although they are expected to continue operating for many years, calls to develop a long-term strategy for them are beginning to propagate. Work on a new reactor would only begin after an extensive planning process and, if approved, it would likely take many years to complete. In the meantime, the neutron research community must deal with a more immediate problem: the effects of extended unplanned shutdowns at both HFIR and NCNR. While unrelated to the facilities’ long-term prospects, the situation has put already highly subscribed resources for neutron research under unusually acute strain. The study is to explore the significance of science that can be performed using a research reactor and to consider the full range of capabilities that reactors can provide. These include neutron-beam experiments as well as materials testing by irradiation, radioisotope production, neutron activation for trace element analysis, and dark matter research. The study will also consider the role of reactor-based neutron sources versus spallation neutron sources. DOE is currently planning major upgrades to its Spallation Neutron Source (SNS) facility that will increase both its capabilities and its capacity. The charge also asks BESAC to consider whether low enriched uranium (LEU) could be used in a reactor without significantly diminishing its utility. Currently, HFIR and many other high-performance research reactors around the world use highly enriched uranium (HEU). It has long been U.S. policy to tamp down the use of HEU to mitigate the risk of its theft by rogue actors who could use it to make nuclear weapons. However, efforts to convert HEU reactors, including HFIR, to use LEU have been inhibited by the difficulty of fabricating suitable LEU fuels. In considering upgrades to HFIR, BESAC is instructed to look to the experience of Europe’s premier reactor-based user facility, the Institut Laue-Langevin (ILL) in Grenoble, France. Commissioned in 1972, the facility underwent a series of upgrades from 2000 to 2018 and is now beginning a second series scheduled to continue through 2023. Although ILL agreed to convert to LEU 20 years ago, the facility continues to use HEU fuel and there are no immediate plans to abandon it. There would be fewer difficulties in fabricating LEU fuel for new reactors if they are specifically designed to accommodate it, as the APS report recommends. The U.S. has not seriously considered building a new multipurpose high-performance research reactor since the 1990s, when DOE planned a large, HEU-fueled reactor called the Advanced Neutron Source that was ultimately cancelled in the face of rising cost estimates. The APS and BESAC reports could prepare the way for a new proposal to be put on the table. 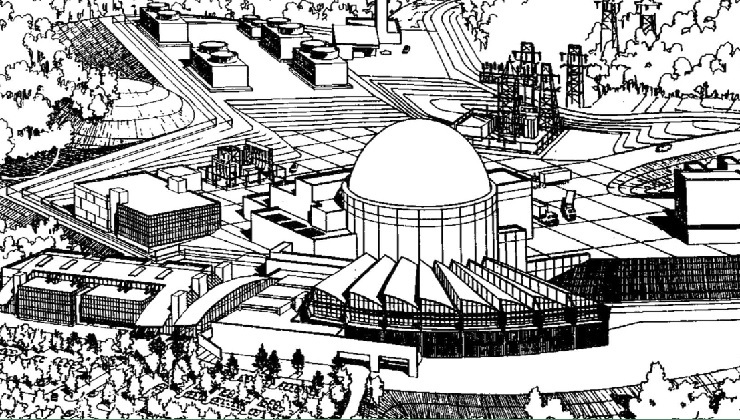 A sketch of the Advanced Neutron Source, a reactor-based user facility proposed in the 1990s. NIST has not announced a response to the recommendation. In October last year, the agency’s primary advisory panel discussed the APS report and NIST Director Walter Copan said he had spoken with DOE, the National Science Foundation, and the National Academies about the “next phase of a national study” on a new reactor. The subject was on the agenda for the panel’s first meeting of this year, but the meeting was cancelled due to the partial government shutdown. The panel’s next meeting will take place in June. A far more serious consequence of the shutdown for NCNR was the facility’s closure for more than one month. During that time, more than 100 experiments were cancelled, causing considerable disruption to the facility’s users, as reported last month in the Los Angeles Times. Operations were restored on Feb. 5. According to Mike Hore, a member of the executive committee of NCNR’s Neutron User Group, the shutdown’s effects will continue to reverberate for months as experiments are pushed back to accommodate the rescheduling of those that were cancelled. A diagram of HFIR’s core, which incorporates two annular fuel elements that together hold 540 fuel plates. The elements are replaced at the end of HFIR’s fuel cycles, which typically last between 21 and 23 days. Meanwhile, HFIR has been shut down since November, following the detection of slightly elevated radiation levels in its primary coolant system following a routine refueling. Harriet Kung, director of DOE’s Basic Energy Sciences program, told BESAC that 45 of the 540 plates within the reactor’s newly installed fuel elements were discovered to be “deflected.” Although a cause had not been definitively determined, she said it is “most likely” due to a faulty weld. She reported that no radioactivity was released from the reactor and no personnel had been exposed. The reactor facility itself was undamaged. In an update on Feb. 14, Paul Langan, who directs the neutron sciences program at Oak Ridge, reported the incident is still under review and procedures are being developed to prevent it from happening again. Kung said that 252 experiments will have been cancelled by May 1 and that Oak Ridge is aiming to restore operations by the end of the fiscal year on Sept. 30. It remains unclear exactly how much the HFIR shutdown will affect researchers’ ability to obtain time at SNS and NCNR, which were already heavily subscribed. Langan told BESAC that Oak Ridge has worked to accommodate HFIR users at SNS where possible, but that not all experiments are transferrable. Another question is how the shutdown will affect the supply chains of the isotopes HFIR produces, which are employed in medical applications and as fuel on interplanetary science missions, among other uses.